Sale of organic produce and foods. On Tuesday, July 15, 2003, a canadian trademark registration was filed for the above pictured logo by Jace Holdings Ltd. 115 King Street, Stellarton, NOVA SCOTIA, CANADA B0K1S0. The Canadian IP office has given the trademark application number of 1184390. The current status of this trademark filing is Registration published. The correspondent listed for is STEWART MCKELVEY of PURDY'S WHARF TOWER ONE, 1959 UPPER WATER STREET, SUITE 900, P.O. 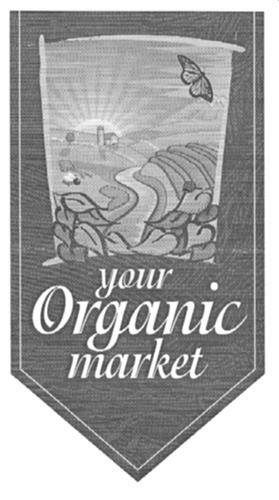 BOX 997, NOVA SCOTIA, CANADA B3J2X2 The trademark is filed in the description of Sale of organic produce and foods. .
Mark Disclaimer: The right to the exclusive use of the words ORGANIC MARKET is disclaimed apart from the trade-mark. (7) Labels, collarettes (bottle-neck labels) -- Note: Not including tie-on labels (20.5.15). (13) Quadrilateral figures with one or more convex or concave sides -- Note: Not including elongated surfaces with one or more convex or concave sides (25.3.1). (1) - Sale of organic produce and foods.